Regular readers of this blog will know by now that I like a bit of free jazz, and if it's also a little funky then so much the better. 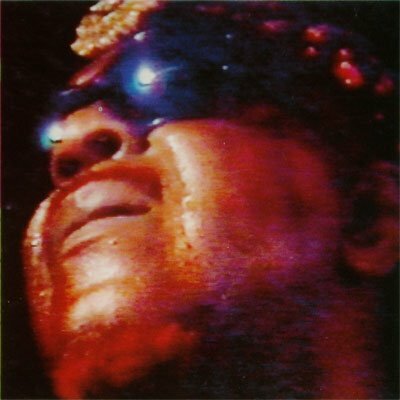 But perhaps even better than funky free jazz is nutty-funky-free jazz, and to define exactly what this sub-sub genre is, look no further than this most bizarre of Sun Ra albums. It's odd in many respects - firstly in that it was released on Blast First, the seminal 1980s avant-noise label that was home to, among others, Sonic Youth and Dinosaur Jr. (when they were good) - the Youth's Thurston Moore was one of the creative forces behind this compilation. The album was accompanied by a single that I've reviewed before. I'd love to say that it's typical Sun Ra, but that's an ever-changing quality as far as his music is concerned, so I won't. Instead, you get a pleasant set of accessible music that veers from 25th century cocktail jazz-funk ('Love In Outer Space') to a tune accompanied throughout by the kind of noise that your children make when they wiggle their lips and blow ('Somewhere In Space'). Elsewhere there's the usual Ellingtonia ('Out There A Minute', 'Dark Clouds With Silver Linings') and 'Space Is The Place' style psychedelic freak-outs ('Next Stop Mars'). So the usual, then. What's remarkable is the coherence of the album despite it's wildly differing styles and the odds'n'sods genesis of the record. I haven't got much to say about the actual recordings. The sleeve gives minimal information - no writers or musicians are credited, save Ra himself and a comment that the record "features John Gilmour (sic) and Marshall Allen". 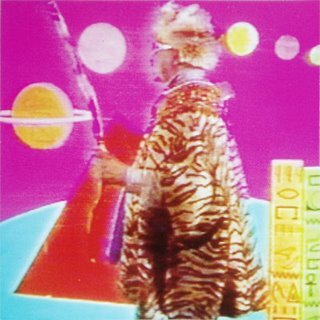 The only other comment on the sleeve reads, "This Compact Disc comprises Sun Ra's personal collection of rare Arkestra recordings from the late 1960s. Made in and around 42nd street, New York City, Planet Earth". 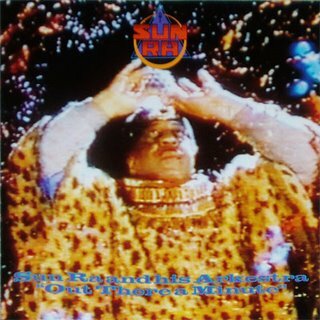 How they ever got Sun Ra to agree to this is anyone's guess, but he was clearly well into the project when he said it was packaged in his "most favourite of sleeves". I'll let you look at the pictures and make up your own mind about that, but this album is much more about the music, which is fantastic. It's also a very accessible place for the novice to start on the musical odyssey that is Sun Ra. Hello! Thanks for sharing the Sun Ra stuff! Do you have the subtitles for the movie "Space is the Place?" Would you post it pleeeeeeaaseee? Thanks again!